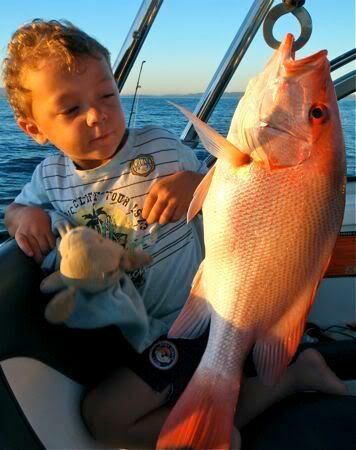 Perfect weather today, so I decided to take the kids out on the big boat for a fish. I wanted to keep it simple, just play around the island and catch as many as we could of what ever we could find. We hit the ramp at 5am and found a few parks still remaining. North Cardinal was our first destination. Thought we might pick up a couple of Doggie Mackerel on sunrise. But despite a massive amount of bait, the mackerel didn't want to play. 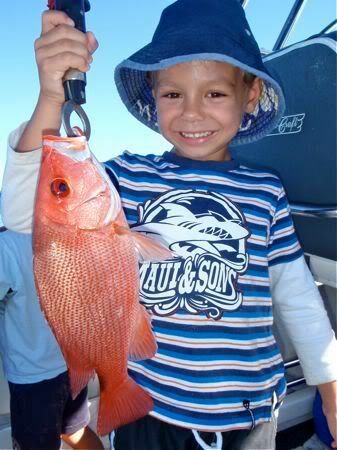 Sebastian managed a 44cm Nannygai off the bottom of a pillie, but despite that it was very quiet. Next stop was my honey hole inside the island. 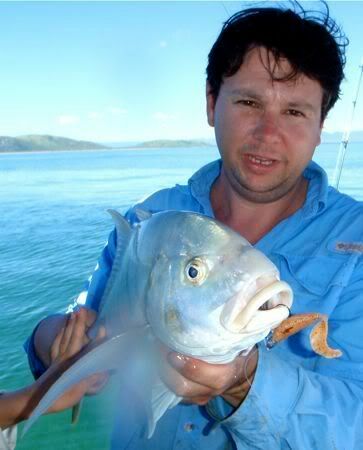 There are usually large numbers of Nannygai here, average 35cm with the odd keeper just over the 40. 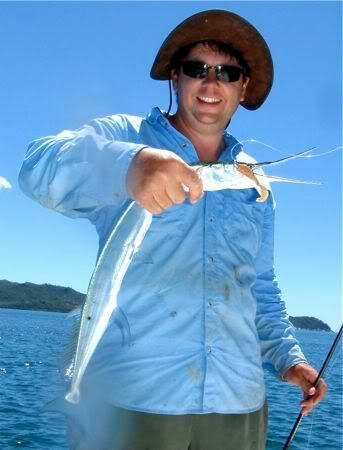 But not today, a remora and small trevalley was all that we could find to play. Next we headed to West Point. I really didn't want to go that far today, but we needed to find fish! I pulled up on a mark I normally fish for Fingermark. But today it was alive with Nanny's. 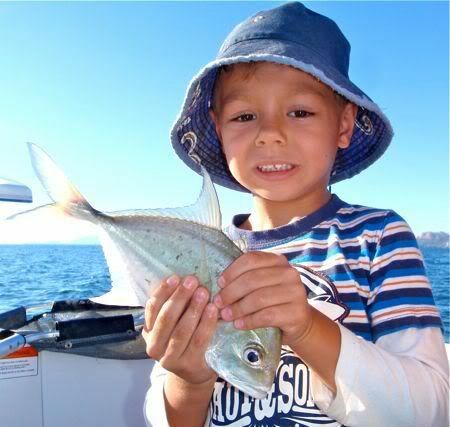 For the next hour or so we got the kids onto fish after fish, but not one went any more than 38cm. Lots of fun for a couple of keen boys. I even got into the action with my Sustain 1000 and 8lb braid. I flicked around a 4in Gulp and found the Nannygai very keen to 'gulp' it down. Good fun! On the way home we ran in pretty close to the beach just inside West Point. The water was crystal clear in the 2.5m range. I could see lots of starfish shooting under the boat as we sped home at 30knots. So I pulled up and gave the kids a look. 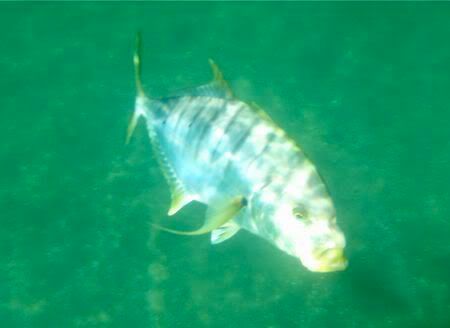 Soon we spotted Golden Trevally and Mackerel cruising around and harassing some small schools of bait. I flicked out another Gulp on the 1000 and soon had a nice little Golden beside the boat. 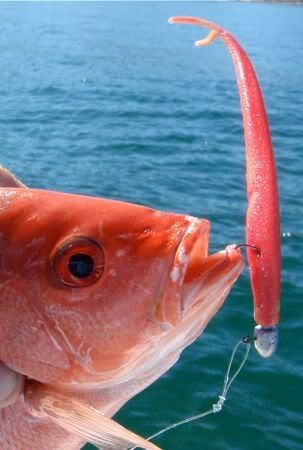 I had another taker after that, but the hook pulled. Kids fell asleep on the way back, so I stopped at middle reef for a bit. Very quiet here, I only managed a LongTom on the plastic. Then it was finally home to clean the boat. An interesting day without venturing too far.